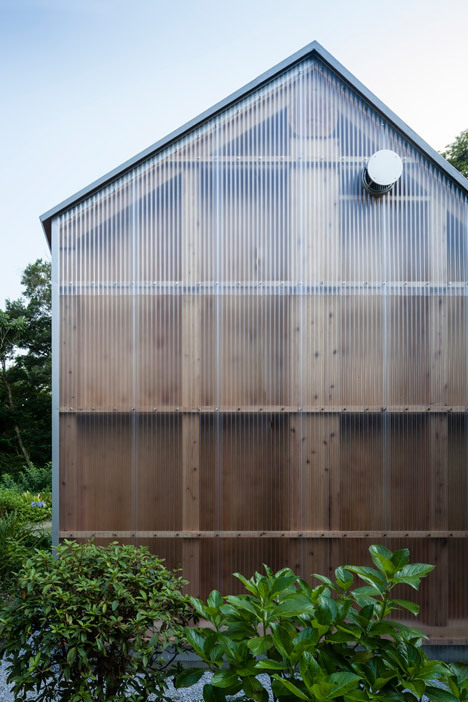 Sheets of translucent corrugated plastic reveal the timber framework of this photography studio in Japan by FT Architects, which also features an angular white roof . 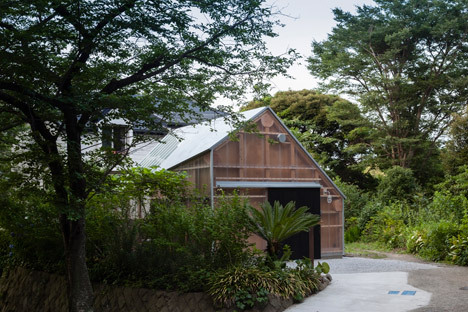 FT Architects designed the 33-square-metre studio, named Light Shed, for the back garden of a photographer’s house in Kanagawa, in the southern Kantō region of Japan. The interior space measures 4.5 by 7 metres and comprises an open-plan studio with a toilet built into one corner – a space “solely composed of essential functions required for a photographic studio”. 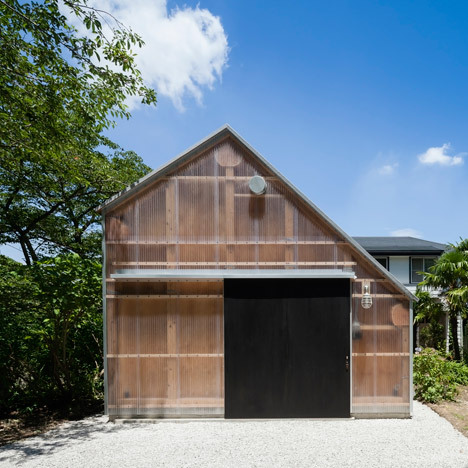 The Tokyo-based studio used a timber frame construction and a multi-faceted gable roof to create the largest possible volume on a tight budget. The unusually shaped roof was designed to reduce the impact of the horizontal supporting struts typical in gable roof construction. 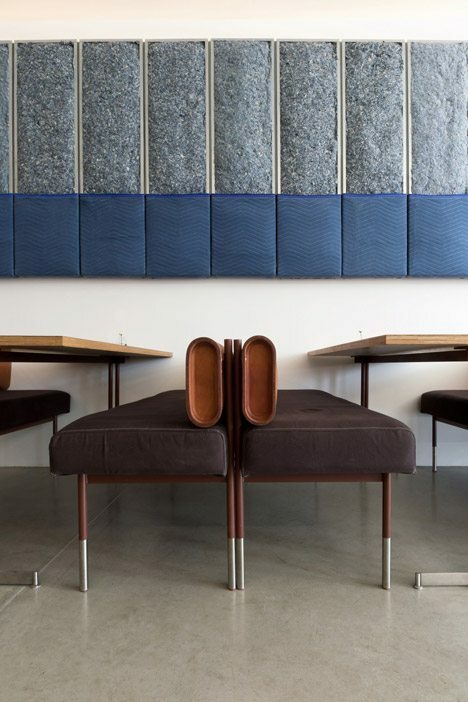 These low-level elements would otherwise have significantly reduced the height of the space and compromised the photographer’s ability to take a clear shot. 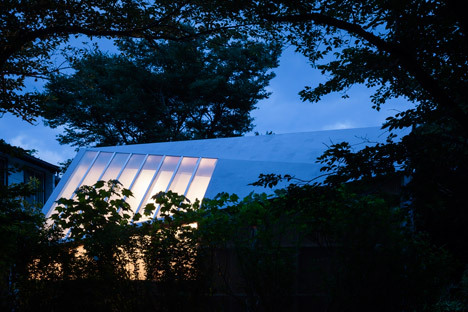 “Following simple geometric rules, the roof was distorted into a multi-faceted, asymmetric form,” said the architects, whose previous projects include a timber-framed boxing and archery arena for a university in Tokyo. 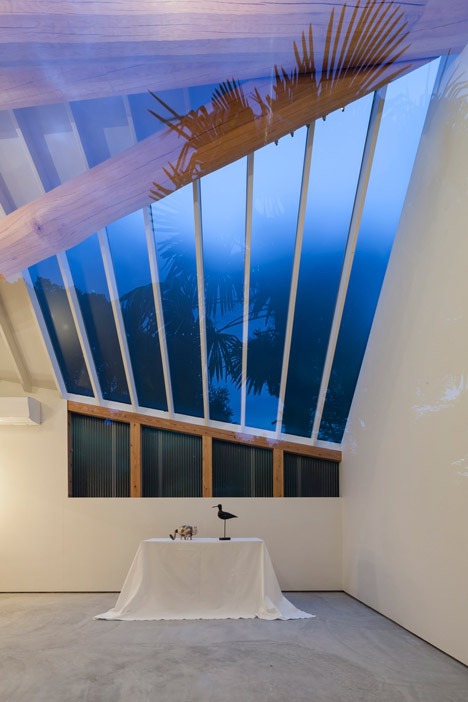 “Three ridge beams at the folding lines support the roof structure, negating the need for any horizontal members that may compromise the height of the room,” they said. 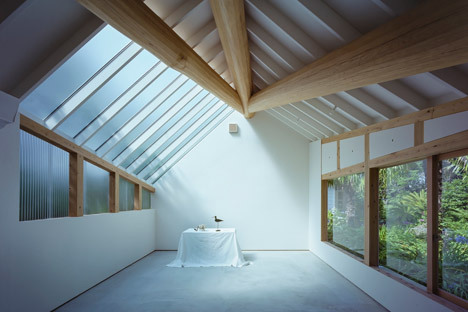 The roughly-hewn joists radiate down from the gable closest to the photographer’s house, giving the roof its asymmetric shape. 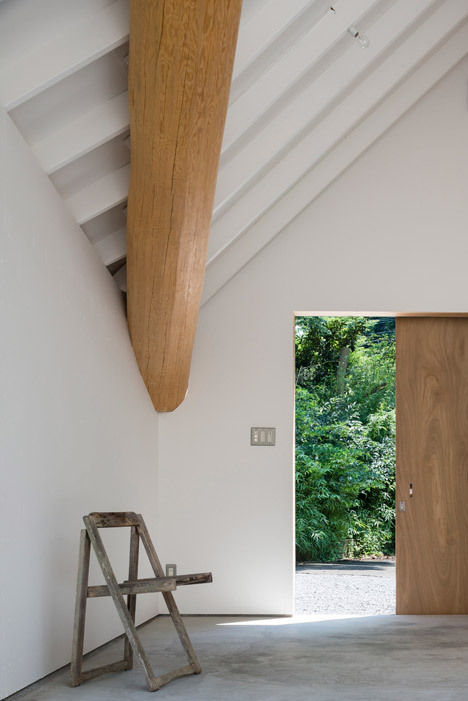 The large logs that create the ridge beams on the interior of the roof contrast with the slim sections of timber used for the rest of the building’s framework. “While the log beams were employed as pragmatic means to fulfil the brief, they also bring along symbolic associations of being one of the oldest building materials,” said the team. 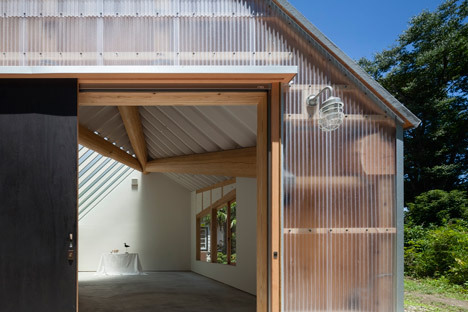 Panels of corrugated polycarbonate were tacked onto the horizontal batons on the exterior, creating a rain screen that leaves the shed’s wooden structure largely visible. The plastic cladding covers a window on the west side of the building, while a large skylight is glazed with frosted glass. This ensures that the majority of the natural light is diffused before entering. 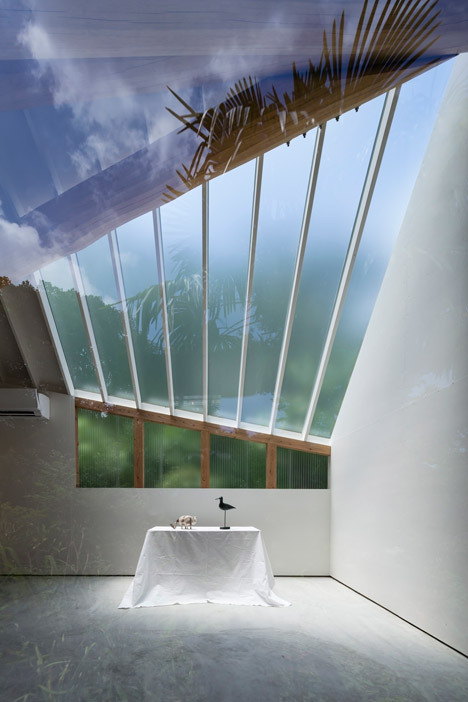 “Direct sunlight creates overly strong contrasts that would result in unnatural portraits,” said the architects. 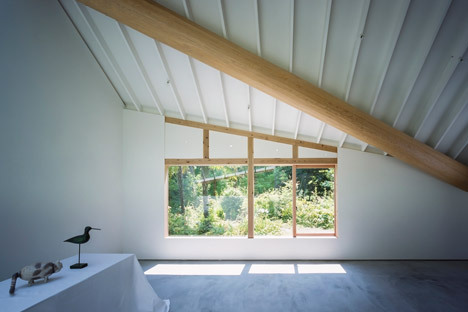 On the opposite side of the space, a wide timber-framed window on the east side of the shed faces onto the garden to provide one direct source of sunlight. 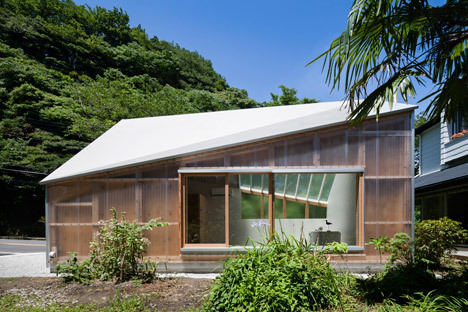 “Together with the wide windows on the side facing onto the lush garden, the interior, although enclosed, is always as bright as the external environment,” added the team. A large black door has been positioned off-centre on the east wall. It slides open to provide an entrance point to the studio. Inside, the door’s natural wooden surface is revealed. 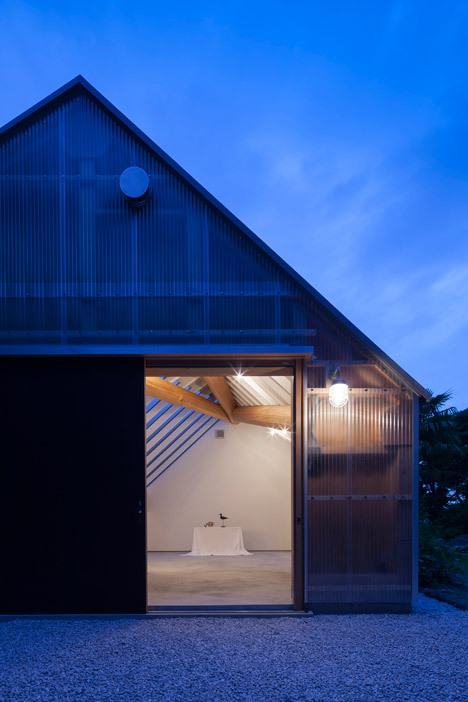 The walls and ceiling are painted bright white, while the pale grey concrete floor tones in with the light grey gravel the shed sits on.